There are bluegrass bands, country bands, indie, hard rock and alt rock bands, roots bands, pop bands, blues bands, punk bands, dance bands, soul groups, jazz combos, chamber ensembles. Genres on lists as long as Kevin Durant’s arm. And then there are the Punch Brothers. Oh sure, their foundation, as it were, may be in bluegrass, usually with a “progressive” fronting it, and it’s a handy enough label when looking at their classic bluegrassian instruments: mandolin, guitar, banjo, bass, fiddle. 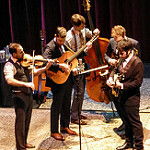 And while bluegrass is a perfectly fine genre, the Punch Brothers bust through that label early and often in their concerts and albums, with all the ease of schoolboy football players tearing through those paper barriers that purport to separate their locker room from the field under Friday night lights. 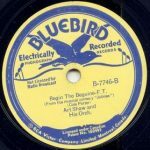 Sometimes, a song strikes us as so lovely in melody or phrasing that the singer could be reciting the New York City phone book, as the old saying goes, and we’d be over the moon and humming the thing all day long. Other times, the writing is so poetic or haunting that the melody need not enter our bloodstream, as it were, for us to be moved to tears. The very best songs, of course, cover both those bases, tickling our melodic bones and stimulating our cravings for language that tells a meaningful tale, suggests a profound truth, or just plain sounds fun and clever and worth repeating to friends. Three songs, summer-themed, on or very near the solstice. A respite, a celebration, a salute to whatever shreds of sanity, shoots of hope and shards of joy we may be able to cultivate in a world that often seems hellbent, for rather baffling reasons, on denying them all. Talk about the power of words to imagine, to relate, to respond. Program selection is an art in itself among symphony conductors, quite apart from everything they do at the podium. But some program choices come easy, which appeared to be the case this past weekend in Santa Rosa Symphony Conductor Bruno Ferrandis’s farewell concert after a robust 12-year tenure. For his final concert weekend, the last performance of which I was privileged to see and hear on Monday night, he zeroed in on Gustav Mahler’s epic Ninth Symphony, long in duration (80+ minutes, depending on who’s conducting) and large as only an ambitious symphony can be in emotional force. 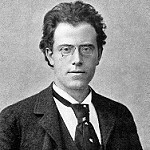 Mahler’s Ninth, quite uncoincidentally, is about endings, leave-takings, death, a subject it explores on a grand scale before it finally, ever so delicately, like the tiniest moth landing on a slowly swaying blade of grass, comes to rest and silence in a final movement wholly unlike any other in the repertoire.